Over on Ravelry, I came upon on the Moonstiches Rhubarb Scarf, a gorgeous, delicate thing that I decided I had to have for myself. There was no pattern, so I felt inspired to write my own. 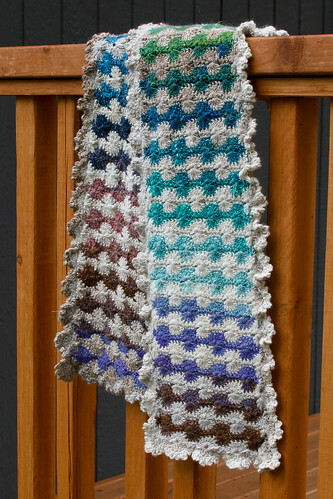 The scarf uses a repeated Catherine Wheel stitch, and is bordered by ruffled semicircles. This one uses Noro Silk Garden yarn, which isn’t as fine as the Diakeito Diamusee Fine used for the Rhubarb scarf, and is 4 repeats across instead of 5. 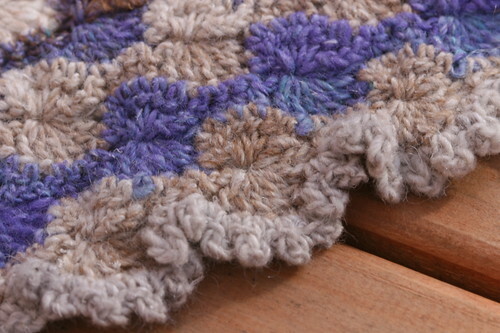 Still, I hope I captured a little bit of the spirit of the Moonstitches scarf. The pattern is available here in PDF format. Many thanks to Moonstitches for the inspiration and permission to publish this pattern. Enjoy! Update Feb 21: I’ve added charts to the pattern. Redownload at the above link if you want them! Update Feb 22: Bonjour, lecteurs de Théonie! (Did I say that right?) Thank you for visiting and for your kind words! Please send any questions or suggestions to ellemennop (at) live (dot) com. Thanks! Thanks so much Elle! I went looking through your archives, you are one crafty lady!!! Very nice stuff. Your charted chicken is one of my favorites. (Alas, I barely know crochet..it might be a long while before I try to knit!) Thanks again!!! LOVE this scarf, but when I try to open the pattern it gives me a blank PDF page. Strange! I downloaded several others today with no problem. I totally love this and want to start on it right away! Please help!! Sorry you’re having trouble. I just tried it and it opened ok here. The file is hosted on Ravelry… it could’ve been a temporary problem, so maybe try one more time! If the link still doesn’t work you could try downloading it directly on Ravelry. If it’s downloading ok and just seems to be a problem when opening it, maybe it has something to do with your viewer. Send me mail if you’d like to troubleshoot. The pattern gets downloaded dozens of times a day and this is the first I’ve heard of someone having a problem opening it, so maybe it’s something specific to your PC. Good luck! Must have been a glitch, I went back in later and it finally opened up! Weird! I don’t have ALOT of experience in crochet, but I have managed a few intermediate patterns before. I started on this today but I (doofus that I am..) already have a question. After a CL,, you pull your loop through the 8 on the hook, then it says chain 3, does that include the stitch that CLOSES the CL? Or do you close the CL, then chain 3? Thanks again for the pattern, it is one of the nicest I have seen. Thanks for any advice too! Sorry, no. It\’s currently only in English. But there are charts. Bonjour, Existe t il une traduction française ? C\’est vraiment très beau. Merci beaucoup pour le patron. C\’est un merveilleux modèle. Merci beaucoup pour ce précieux cadeau! beautiful ! thanks for the pattern. HOU ! C\’est magnifique, gorgeos ! I love it !! Big Thanks for the pattern, I put it in my faves on ravelry ! great scarf, very beautiful!!! thanks for the pattern! Great pattern thank you !